Ngoc Lan's 6th solo studio album released at the beginning of 1991 was really unlike the rest of her other albums. For one thing, it wasn't really a solo recording project completely since the album had included two very long medleys, each recorded as duets with Trung Hanh. And several of the songs selected for this album were songs Ngoc Lan had either partially recorded as part of a medley in the past for other music production labels, such as "Yeu Nhau Di" (Besame Mucho) and "Nhung Loi Me Hoac" (Paroles), or had previously recorded in its entirety, in the case of "Khi Co Chang" (Je Ne Suis Que de L'amour). "Yeu Nhau Di" was probably the most enjoyable to listen to out of the three previously mentioned tracks on this album, while the other two were rather disappointing. recorded version on video and just couldn't get enough of it. But for those fans of Ngoc Lan such as myself who are a bit fussier, with higher expectations for our idol, we found the album version of this song a total disappointment. The track we heard in the music video, Ngoc Lan had sung beautifully in both French and Vietnamese lyrics. The album version of "Khi Co Chang" had the exact same music arrangements, but was recorded only in Vietnamese. For many of Ngoc Lan's fans who particularly like the way she sings in French, the album version left us with utter dissatisfaction. But since Ngoc Lan had already made us fall in love with the song with that fantastic music video, it can be forgivable that she had left out recording the French lyrics on the album version of the song. However, the laziness and careless production on the track, "Nhung Loi Me Hoac" (Paroles), in which Ngoc Lan recorded as a solo number, leaving out entirely the male-spoken lyrics really went beyond any chances for forgiveness. It sounded ridiculous! The lyrics to the song set up a dialogue, and it was meant to be performed as a duet. Only the lyrics for the male vocalist are to be spoken only in the song, while the female vocalist sings the melody and chorus. If the song is not performed as a duet, then there really would be no purpose. If I had to choose what would be my least favorite of Ngoc Lan's extensive body of work as a recording artist, I'd have to say that it would be her recordings of medleys, known as "lien khuc" in Vietnamese. There was a good number of years when medleys were a popular fad in the Vietnamese music industry. Every Vietnamese music label had to come out with these annoying, silly medley cassettes. It was like a plague. And almost every artist was jumping on the bandwagon to record these medleys. I really couldn't figure out how medleys had become so popular. When you think about it, medleys were nothing more than just a sctambling of a bunch of mismatched songs lumped together in one monotonous upbeat tempo. I can see why the music producers liked medleys, because they were a lot cheaper to make. But why did the Vietnamese audience like medleys so much? Ngoc Lan's 6th solo studio album, given how it was released in 1991 when medleys had reached its height in popularity among Vietnamese audiences, would also include two of these annoying medley tracks. I must say, the medleys on this album were much more carefully produced than most of the other medleys I've heard from Ngoc Lan on other music labels. But they are still medleys. Another sure sign that Ngoc Lan was trying very hard to keep up with the times with this album was her selection of "Lambada" as the first of many songs for one of the two medleys. To keep up with a Latin dance craze that had recently swept the nation in America, including the Vietnamese community, Ngoc Lan sang "Lambada" in French to begin with the medley of songs. 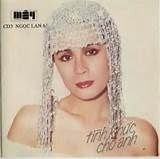 I must admit that "Lambada" sung in French by Ngoc Lan sounds irresistibly charming. To this day, this medley recorded by Ngoc Lan and Trung Hanh with only a small excerpt of "Lambada" sung in French lyrics at the beginning is one my biggest guilty pleasures. The album did include two tracks in particular that captured the essence of Ngoc Lan's vocal talents; "Niem Dau Noi Nho" (Eternal Flame) and "Nguoi Yeu Oi Gia Tu" (Sayonara Means Goodbye). The beautiful interpretations by Ngoc Lan on these two tracks are glorious enough to even cause the most disappointed fan to overlook most of this album which had been so poorly produced.